ComicFury artists join together to challenge themselves! 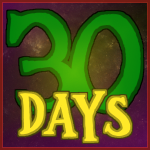 30 characters in 30 days - one new character every day, for the entire month of April. Think you're up for the challenge? Join now!